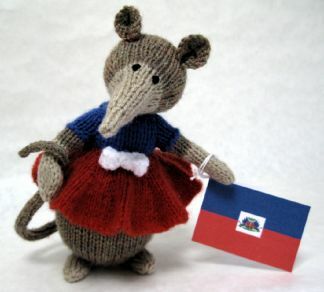 Designed to raise funds to aid the victims of the Haitian earthquake 2010. Please consider making a donation in exchange for this pattern. Details can be found at http://www.dec.org.uk/haiti-earthquake-facts-and-figures. Thank you. You will need Of Sirdar Click DK, 50g balls: 18g in Cobble 129; of Sirdar Snuggly DK, 50g balls: 8g in Engine Red and 2g in Soldier Blue; of Hayfield Bonus DK, 100g balls: 6g in Stone 889; oddments of black and white DK yarns; 20g of washable toy stuffing; long tweezers; thin white card and white twine for label.